Rating: Some material may not be suitable for children. Since ancient times, stories of epic battles and mystical legends have been passed through the generations across the rugged and mysterious Highlands of Scotland. In “Brave,” a new tale joins the lore when the courageous Merida (voice of Kelly Macdonald) confronts tradition, destiny and the fiercest of beasts. Merida is a skilled archer and impetuous daughter of King Fergus (voice of Billy Connolly) and Queen Elinor (voice of Emma Thompson). Determined to carve her own path in life, Merida defies an age-old custom sacred to the uproarious lords of the land: massive Lord MacGuffin (voice of Kevin McKidd), surly Lord Macintosh (voice of Craig Ferguson) and cantankerous Lord Dingwall (voice of Robbie Coltrane). Merida’s actions inadvertently unleash chaos and fury in the kingdom, and when she turns to an eccentric old Wise Woman (voice of Julie Walters) for help, she is granted an ill-fated wish. The ensuing peril forces Merida to discover the meaning of true bravery in order to undo a beastly curse before it’s too late. 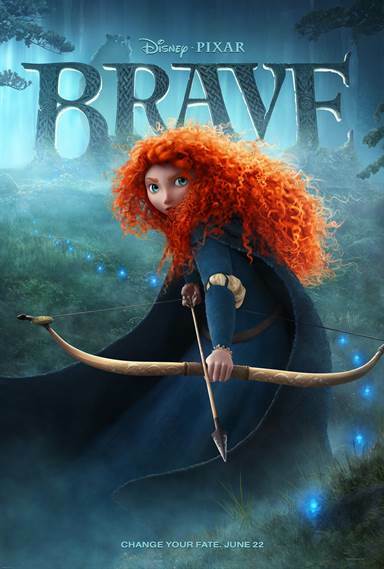 Download Brave in Digital HD from the iTunes store. Brave images are © Walt Disney Pictures. All Rights Reserved. The latest feature from cinema Juggernaut Pixar is Brave and while visually it is everything we've come to expect from that think-tank of geniuses it might disappoint many loyal fans. This marks the 13th animated feature from the world's most consistently successful film company and the first (for them) set in that version of the past forever favored by Disney, that of princesses, kings, queens, witches, evil spells and puckish secondary characters. For all its beauty, the film's emotional line and dramatic theme are both more familiar and less inventive than what's usually delivered by the studio. Younger kids won't mind, but many viewers accustomed to relying upon Pixar for something special will feel somewhat letdown due to the lack of adventurousness. Part of the problem is that Brave never becomes the film that seems to be promised at the outset. After a beautiful and eventful prologue in which Scottish princess Merida (Kelly Macdonald) receives an archery bow for her birthday, glimpses blue will-o'-the-wisps floating through the forest and sees her father, King Fergus (Billy Connolly), lose a leg to a ferocious bear, the action jumps ahead to her adolescence and her obligation to get married. Under the strict tutelage of loving but demanding mother Elinor (Emma Thomson), Merida has learned the necessities but is wild at heart, desperate for her days off when she can ride off on horseback and perfect her archery. As for marriage, nothing could be less appealing. One look at the top suitors from the top three leading clans and you can see what she means; they're the three stooges of Scotland. Once Merida shows them all up in a archery contest and her furious mother tosses her daughter's prize bow in the fireplace, the headstrong girl takes off on her enormous steed, Angus. It stands to reason that this first half-hour sets up expectations of a story in some way involving a renegade princess, trouble among the clans and/or a mysterious adventure involving the wisps and some Stonehenge-like arrangements that come into play. The odd turn taken by the story might be embraced by those comforted by the familiar, but it's a move that channels the film into startlingly well-worn territory. The typical toothless and haggard old witch (Julie Walters) willing to cast a spell to grant Merida's wish to change her mother so as to alter her own fate. The spell, lo and behold, turns Elinor into an enormous bear, one that retains Elinor's brain and heart but cannot speak. Thus ensues a lot of slapstick as bear Elinor knocks about in quarters too small for her and tries to communicate while Merida feels remorse and endeavors to reverse the spell. What results is a film that starts off big, promising a lot but diminishes into something much less endearing as it rumbles along, with climactic drama that is both too conveniently wrapped up and hinges on magical elements that are somewhat confusing to boot. On a sensory level, however, Brave is almost entirely a delight. The wild beauty of Scotland, of the verdant forests and the craggy peaks, is lovingly rendered with a gorgeous palette of painterly colors. Even better, the voicing's here are among the most exceptional and pleasurable of any animated film you might care to name. The active and uplifting score is another major plus in a film that has played it safe instead of taking chances and going for something new. Overall Brave is definitely a worthy effort from the crew at Pixar, but like a novice archer, it hits just shy of the bullseye. Brave images © Walt Disney Pictures. All Rights Reserved.